Expect the Unexpected - this is how to best describe the new build sailing yacht project bd 120 by beiderbeck designs.To start at the aft, the yacht offers a fold-out stern platform, which can be used as a beach club with its own shower and toilet. To the right is a minibar in the stern structure for cocktails while the scampi sizzles on the grill to your left. To call it a dining corner would be to insult the well thought-out external dining area in the rear quarter of the vessel. The deck, which is protected on both sides by an elongated structure, is just that spacious.Meanwhile, the crew of up to six have their own access through to their cabins, while a large glass sliding door leads to the salon. Sooner or later the dimensions and possibilities of the nine metre beam of the yacht should become blatantly obvious. Two sofas facing each other with a two-seater couch at the head of them lends the setting a warm, chatty or conference-style atmosphere. The exemplary cream-coloured cushion pads have a distinctly comforting effect.The first-class interior can of course be customised to your liking. Fully-glazed and obstruction-free window facades grant a full view of the sea from all sides. A large deck section at the top of the stairs has a similar effect, acting as an atrium for the salon below.Further step-free access via a sliding door on the same level again leads to the front of the ship to the cockpit. All the controls come together here, with the exception of the code zero winches, and fully concealed they do not present any tripping hazards. The two steering wheels are situated a good four metres behind the mast and the yacht can essentially be sailed single-handed with no more than push button functions. With 20.75 metres to the bow section, the helmsman will feel like he’s only steering a 70 foot yacht.You can keep an eye on the mainsail trim from the open-air Bimini roof. The 45 metre-high carbon fibre mast carries 680 m2 of upwind sail area, which is opposed by a 4.2 metre draught. This allows 130 tons of light weight for serious sporting requirements, emphasised by 1,000 m2 Code0 on the steady stay. The rig, with its self-tacking furling genoa and the carbon fibre furling boom for the main, has a proven track record. Throughout the design phase, particular importance was attached to simple handling and easy maintenance.This also applies to the engineering room below-deck, which offers technicians or the crew an additional direct access route from the stern platform as well as to the engine room in front of it, where all the vital functions come together in a separate control room. Generators (2x 40 kW), converters, air conditioning units, water purification, compressors and, last but not least, the 300 kW main engine are all monitored from here during operation.Below deck, there are more separate seating areas next to the helm stations, which can be adjusted either leeward or windward when travelling under canvas. The window panes looking out can be removed, depending on how extreme or pleasant the wind and weather conditions are. Dead astern, the cockpit can be separated from the salon if the crew is handling the yacht and the owner and his guests want their privacy in the salon. This high level of discretion makes it suitable for purely private or commercial charter use as well.The strict division between sections is fully taken into account. This starts with two 3.4 metre dinghies instead of one large one which means, for example, that the crew can make supply runs regardless of whatever land excursions the VIPs are making. In addition, these are easier to handle than larger, heavier dinghies. The tenders are typically stowed in recesses on the foredeck and covered with tarpaulin.Going back below-deck, the crew live in the aft section with their own mess across from the machine control room, next to which the on-board laundry facilities and dryer are housed. 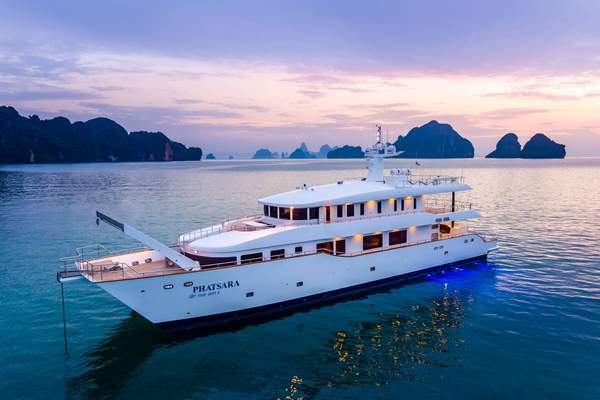 The three double cabins, two on the starboard side with a separate shower and bathroom, and one on the port side for the boat captain with a double berth and its own washroom, provide more than enough room. In front of these lies the state-of-the-art galley with its induction hob, steam oven and soft ice cream machine for sophisticated gourmet cooking experiences. A dumb waiter means dishes can be brought straight up into the salon.On that subject, a lift can be installed midships, making the bd 120 wheelchair-friendly. Ground-level access to one of the two VIP cabins is also possible. Both double cabins have their own bathrooms with shower cabins that, at 1.1 x 0.8 metres, are unusually generous for a 120 foot yacht. Two twin guest cabins are located another two stair steps down and separated by a passageway, leading to the owner’s realm.The owner benefits from a fully-networked office with WLAN, G4-mobile radio and satellite communications which is separated from the suite in the forecastle. The king-size double bed is centrally-positioned underneath a tinted skylight. The seating furniture, an extendible flat screen display and a dressing table are fit for any five-star hotel. The owner’s bathroom, with its 1.35 metre wide shower, is simply the cherry on top of the cake.What is perhaps the most spectacular room on the bd 120, which would be more in place on 50+ metre-long motor yachts, and very unexpected here, can be found on the starboard side, just opposite the well-lit internal dining room. That room is a cinema with a concave, 65 inch screen, which can not only play every video format imaginable, but can also be connected to all the latest gaming consoles. The associated HiFi sound system requires very little explanation. Cinema-goers can also make themselves comfy by laying down on loungers in front of the screen. United Yacht Sales New Jersey would love to guide you through a personal showing of this 118' Custom Bd 120 2019. 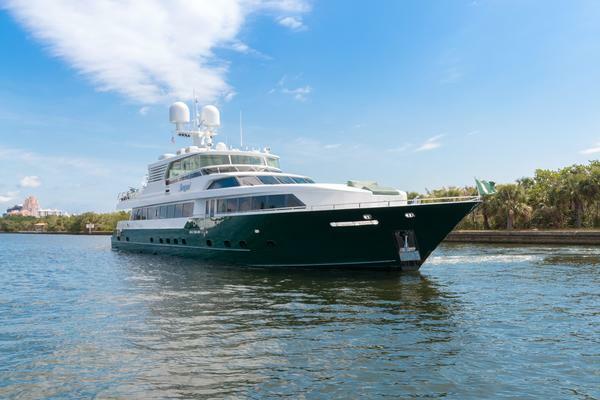 This yacht for sale is located in Kiel Germany and priced at $18,500,000. For a showing please contact us by filling out the form on this page and we will get back to you shortly!